As a key service the United States Commercial Service sponsors, trade missions afford American corporations the opportunity to utilize the vast international network of the United States government to either jumpstart or further expand their global operations. Because of the National Export Initiative’s focus on boosting U.S. exports, American businesses have access to a myriad of government services aimed to help them succeed overseas. While abroad on trade missions, American corporations experience the tips and tricks of penetrating the market and conducting business in a foreign country. The benefits of trade missions speak for themselves, including the chance to meet with high-ranking foreign officials and buyers at networking events and to receive briefings produced by local market experts. The U.S. Department of Commerce has 11 trade missions planned for 2017, including the annual Trade Winds series, which “has facilitated more than $240 million in business deals for hundreds of U.S. companies and organizations that have participated in past events”. 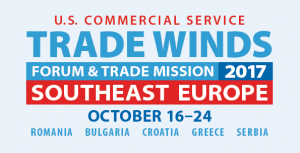 This year, Trade Winds will connect registered businesses with the markets of Southeast Europe, including Romania, Bulgaria, and Croatia, among others. Trade missions afford small to mid-sized companies in the United States unprecedented opportunities for international expansion. More information on upcoming U.S. Department of Commerce sponsored trade missions can be found here.